Why should I hire you as my professional window cleaner? There is definetly an art to cleaning windows perfectly. We have mastered the techniques required to guarantee 100% satisfaction for every customer. We will be on time, neat, courtious, friendly and clean so you will want us back for years to come. Yes – We Carry the highest levels of insurance in the industry because our customers deserve to be worry free and have total piece of mind. Coverages include general damage liability and Worker's Compensation/disability. How do you figure the price? Estimates are always free and in most cases you do not have to be present for us to figure out your charges. We base our price on the type and number of windows that you have. 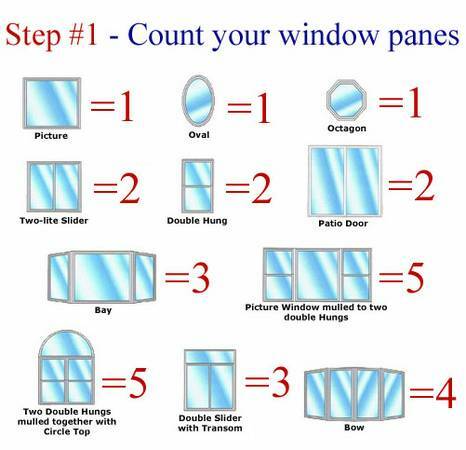 The first step is to count your windows. Below is an example of window types. Once you have an idea of your window count, call us and we will give you an estimate over the phone. If you would like us to come out and count your windows and provide you with an estimate in person, we will be glad to do that as well. The average house to clean Interior and Exterior windows will take us 2 to 3 hours. No - We can complete our services with or without your presence. However if we are cleaning the interior of your windows we would need to prearrange access to the inside. What should I do to prepare for you coming? If you have fragile, sentimantal, or irriplaceable antique items on the window sills or in front of the windows you probobly want to move them. All other items including furniture and window treatments will be carefully moved and put back by us. We can still clean your windows effectivly in light or moderate rain. We will evaluate the weather conditions with you at the time of your job. Most customers tell us to go ahead if we can do it. It is going to rain sooner or later. However if you would rather not have your windows cleaned in the rain we will be more than happy to reschedule your appointment. First we will move furniture and any items in front of your windows. Then we will remove your window screens and take them outside for cleaning. We will clean the Interior and Exterior sides of your windows simultaniously, double checking each others work as we go. We put protective towels down on the inside as a precaution to keep your flooring clean. The exterior windows will all be done by hand, up close, using ladders. We do not use poles. We have developed a system to perfectly clean the glass, sills and frames of your windows. We will apply our specially formulated eco friendly solution to the glass with an industrial window cleaning scrub pad. Then we blade scrape the entire surface of the glass to remove paint, stain, bug stuff, tree sap, kid stuff or any other foriegn material stuck on the surface. We apply our solution a second time again scrubbing the entire surface. The solution is then squeegeed from the glass and the edges, frame and sills are wiped dry using eco friendly towels. Yes we clean screens using a low pressure power washer. We then wipe the screens dry and return them to the windows after the windows are cleaned. Can you remove paint and stain from my windows? Yes we can! We have a process that removes paint, stain, varnish, caulking, concrete, and other construction material from your window glass. What if I have tinted window film on my windows? No problem! We can clean tinted windows with our solution safely achieving the same result as a regular window. Can you remove hard water stains from my windows? We do have a process that can remove hard water stains, However if the hard water stains have been left on the glass for a long time they will have begun to etch into the glass. If your glass is etched we will be able to remove the majority if the stain but upon very close inspection you will still see the little etch marks. When do I have my windows cleaned? Most people clean their windows twice a year, spring and fall. If you are selling your home it will help to have clean windows. If you have your siding power washed, your windows will need to be cleaned. Graduations and other special events are also good times. We can still clean windows in the winter give us a call for winter discounts.